BIG SALE!! BRASS CRYSTAL BALL STANDS BIG SALE!! This Elegant tripod solid brass Scroll sphere or egg stand has scrollwork on the legs and a smaller angled opening to hold eggs perfectly. For spheres, marbles or eggs from 20mm up to 60mm or 2 1/2" diameter. Simple and elegant shiny brass embossed sphere or egg tripod stand has scrolling on the legs and sides. In two sizes these stands can hold marbles, spheres or eggs from 30mm up to 80mm or 1 1/4" to 3 1/2" wide. 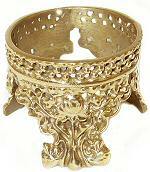 Attractive solid brass Scroll sphere or egg stand is available in 2 sizes small and medium. They will hold spheres, eggs or marbles from 1/2" W to 2 1/2" wide. The King George Brass stand lends a royal appearance to any decor. This coronet style stand has intricate tulip and beadwork designs and comes in four sizes. The lacquered finish assures long term easy care. 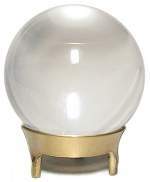 Solid brass polished egg or sphere stand in x-small for spheres, marbles or eggs from 45mm up to 75mm or 3" diameter. See King George in 3 larger sizes. Very nice elevated tripod solid Brass Egg and Sphere Stand. Spruce up your egg and sphere collection, view pieces that are crowded out with this taller Egg/Sphere brass tripod stand which is 2 1/4" high and 1 1/2" wide for your favorite eggs or spheres. Very nice wide tripod solid Brass Egg and Sphere Stand. Spruce up your egg and sphere collection, with this simple and elegant brass tripod stand. Available in two widths 1 1/2" or 1 3/4" wide to fit your eggs or spheres better. These Large sized elevated tripod solid brass sphere or paperweight stands have a sleek, classic appearance and holds spheres up to 6" wide easily. X-Large sized elevated tripod solid brass sphere or paperweight stand has a sleek, modern style and holds spheres up to 8" wide with elegant simplicity. Classic brass Caliper stand is available in three sizes and traditionally used for globes and other prized spheres or specimens. The tips and base have protective rubber pads. The lacquered finish assures long term easy care. This Solid Brass Tripod is a basic staple for any collector. Simple and sturdy, these stands will last a lifetime. They can hold spheres/marbles or eggs from 40mm or 1 1/2" up to 70mm or 2 3/4" diameter. 5/8" H by 1 1/2" Dia.